PLUS! … Win a Double Pass to attend the Awards in Melbourne. To enter send in your name and mobile number to win@dancelife.com.au with title ‘Ausdance Awards’ with the reason you want to attend. Closes Sept 15. 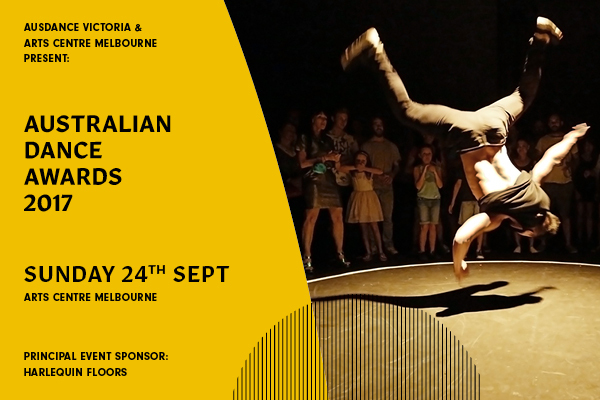 The line up of performances, presenters and hosts has been confirmed for Australian dance’s night-of-nights – 2017 Australian Dance Awards – taking place at the Arts Centre Melbourne on Sunday 24 September. Read our previous article to see who all the nominees are in 12 categories. The gala awards presentation is a public, ticketed event, giving anyone with a passion for dance the opportunity to enjoy a night of incredible dance entertainment. Tickets still available for this Gala evening >> click here. the all-female Wurundjeri dance group, Djirri Djirri Dance Group. Celebrating twenty years in 2017, the Awards are the pre-eminent event on the dance industry calendar. They recognise and honour dance artists, educators and administrators in 12 categories of achievement. Dancers in PILE OF BONES: Marlo Benjamin, Samantha Hines, Harrison Ritchie-Jones and Jack Ziesing. The star array of presenters includes David McAllister AM, Jonathan Holloway, Wesley Enoch, Jason Coleman, Lucy Guerin, Stephanie Lake, Jasmine Moseley, Sue Healy, Helen Simondson, Jerry Remkes, Jane Crawley, Tony Grybowski, Jenny Kinder, Emma Cochran, Paul Selwyn Norton, Angharad Wynne Jones, Angela Conquet, Merindah Donnelly, Carla McGrath, Robina Beard OAM and Julie Dyson AM.